Free VPN for macOS is here! 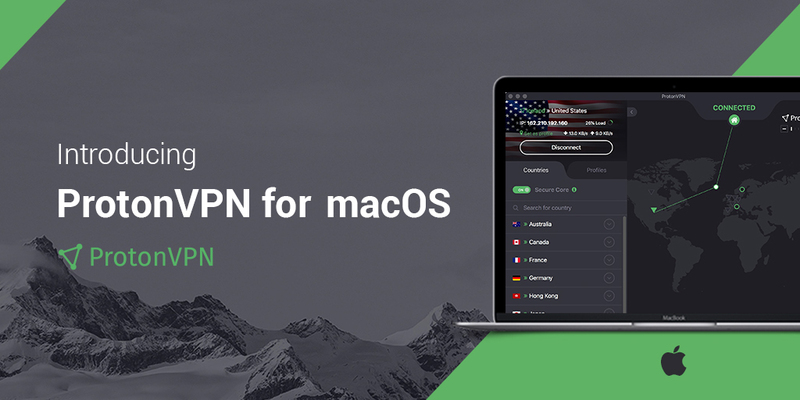 ProtonVPN is now available for all macOS users. Posted on May 30th, 2018 by ProtonVPN Admin in Articles & News. Today we’re launching our macOS VPN app. 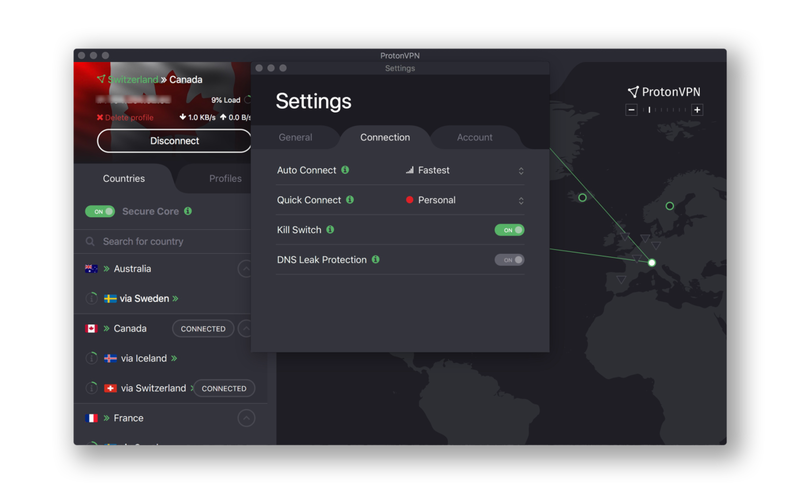 Now, all Mac users can get ProtonVPN for free and protect their Internet connection with a single click. 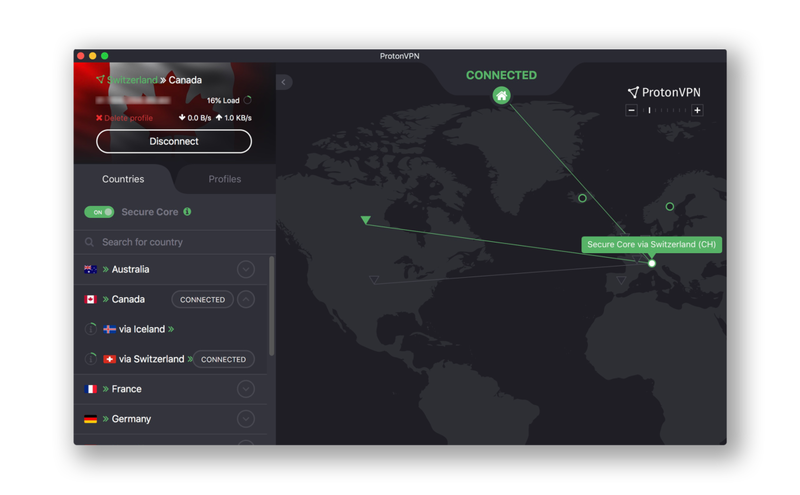 With our VPN for Mac application, it is now extremely simple to switch countries, create custom profiles, connect to the Tor network, and route your traffic through our Secure Core servers. Not to mention all the essential perks of ProtonVPN, like hiding your IP address, defending against cyber attacks, and unblocking censored content. To download the macOS app, click here. If you already have a ProtonVPN or ProtonMail account, you will be able to log in and begin using the app. New users can create an account here. We are particularly excited about our macOS app because so many members of our community have requested it. Our mission is to make cyber security and privacy easy and accessible, and this launch marks a major milestone. Given that more and more people are now using Mac devices, the demand for macOS security tools is no surprise. In recent months, we have worked closely with over ten thousand beta testers from the ProtonVPN community to fix bugs and develop an app that is easy to use and also looks great. The initial feedback has been very positive and we’re excited to finally share with the rest of you our free MacOS VPN application. As part of our mission to make online privacy accessible to everyone, ProtonVPN comes with a free version that anyone can use. Unlike other VPNs which claim to be “free”, ProtonVPN is actually free. There are no bandwidth limits, no ads, no logs, and unlike other “free” VPNs, we do not secretly sell your browsing data. If you would like to get access to advanced features and to support the project, you can upgrade to the paid version. We built ProtonVPN to fill major shortcomings among the popular VPNs, some of which secretly contain malware or do not adequately protect users. ProtonVPN was developed by the same team of scientists who met at CERN and MIT and created ProtonMail, the world’s largest encrypted email service. Today, ProtonMail and ProtonVPN are used by millions of journalists, activists, businesses, and ordinary citizens around the world. With the launch of ProtonVPN for macOS, we’re bringing online security to even more people. Our new macOS app provides a highly secure (yet easy-to-use) alternative to OpenVPN applications like Tunnelblick. If you have used our apps for Android or Windows, you will recognize many of the features in our macOS VPN client. Easy to use. Upon launching the macOS VPN app, users can instantly connect to the fastest server with our Quick Connect feature. Modern IKEv2 protocol for higher performance. Enjoy a faster and more stable connection. IKEv2 offers much higher performance than OpenVPN, making ProtonVPN one of the fastest macOS VPNs (speeds can exceed 300 Mbps under the right conditions). Easily connect to any country with a single click. Choose from a list of available servers from around the world, or connect with a single click on the map. Choose from Secure Core servers, Tor servers, and P2P servers. The macOS app makes it easy for users with paid plans to take advantage of all our additional security, privacy, and file sharing features. 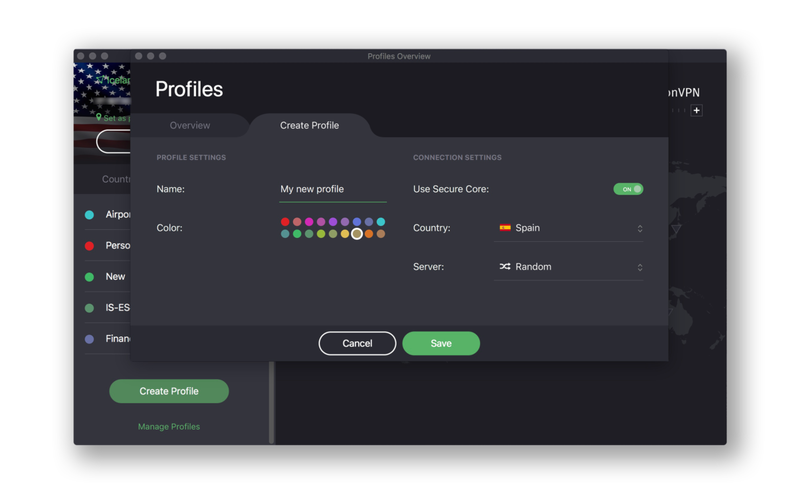 Create and save custom connection profiles. When you find a server you like, you can easily create a custom profile for that connection. VPN kill switch. With the kill switch security feature enabled, ProtonVPN will cut your Internet connection if your connection to the VPN drops, preventing data from leaking when the VPN is not connected. The macOS VPN app has already been through multiple rounds of testing, but we are constantly improving ProtonVPN and we welcome your feedback. If you have any suggestions or need support, you can reach out to us here. Thank you again for your support, which is essential for keeping ProtonVPN freely accessible. Your support also allows us to develop new products and features, like our upcoming iOS app! We look forward to continuing to protect your online privacy. Wow, that’s what I was exploring for, what a stuff! present here at this blog, thanks admin of this web site. Hello! Thank you for your kind words and support! Another user on my household mac receives an authentication window while logged into their account, which the do not want. Is there anyway to stop this? If you are talking about the step shown in the Successful connection section (https://protonvpn.com/support/protonvpn-mac-vpn-application/), the prompt is generated by macOS itself in order to allow the app to connect to the VPN server. Just simply click on Always Allow and you shouldn’t get the prompt as long as you won’t restart your computer. I’ve installed Prontonvpn on my MacBook Air but there is a problem. the connection is well established but when I start Safari or other brother there is no traffic , blank page ! Being a Visionary subscriber I had access to the beta. Still, I am very happy with the 1.0 release. Great to see progress on the security front. I must say this is is also the most stable specialised VPN client I have used. Kudos to the developers! And it just works great! Could be a hard work, I wish the best for the team, and just can’t wait to see what will be the next thing you come up on next. Thank you! Hi! Während der Installation soll man Zugriff auf den Schlüsselbund geben… gebe ich euch damit nicht auch Zugriff auf alle meine im Schlüsselbund gespeicherten Passwörter? Hey Alicia! The app only picks ProtonVPN password from the keychain so you do not have to re-enter it while establishing a new connection each time. The VPN client looks great, but requires a minimum OS of 10.12 (Sierra). Why am I (and others) being penalised for having an older Mac that operates a maximum OS of 10.11 (El Capitan) ? We have followed Apple Security requirements while developing the app which is different compared to earlier versions of macOS. However, we will check what can be done about it in later app development stages. Congratulations to Mac OS users!